See the bright, clear difference of ColorPRO Technology, with precise lines and sharp, fine detail. Produce high-impact graphics with an extended range of colors. 24-lb Bond with ColorPRO Technology is designed specifically for PageWide XL printers to deliver professional quality and striking results and is optimized for high-production environments. Bond papers with ColorPRO Technology use 19% less ink and provide up to 60% more color than standard bond papers without ColorPRO Technology. Keep a brisk pace. HP printing materials are designed together with PageWide XL pigment inks and PageWide XL printers to provide dependable, quality performance. Optimize your everyday printing with the reliable, trouble-free performance of costeffective HP 24-lb Bond with ColorPRO Technology. 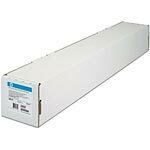 Many roll sizes are available, helping to save time and lower costs with less cutting and less waste.